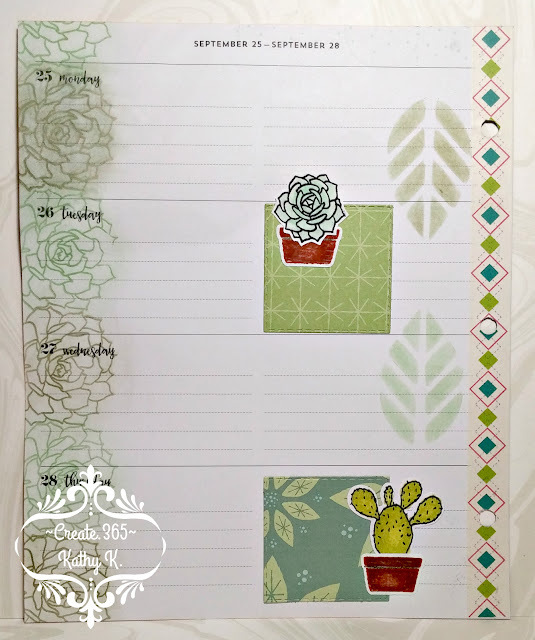 While I wait for my new planner supplies to arrive, I am experimenting with what I have already and trying to make it work as best I can. 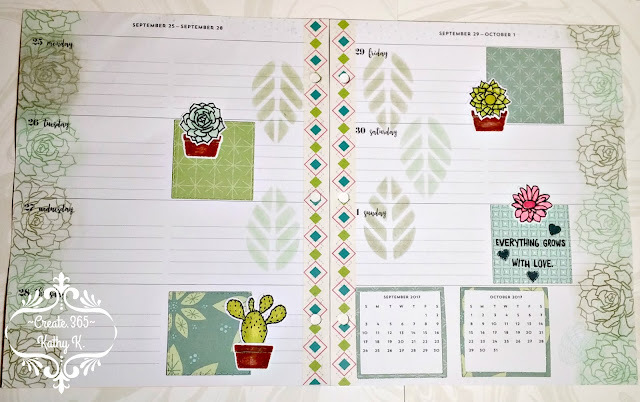 The new planners have all arrived as of last evening, but still waiting on the rest of the essential items to arrive...they seem to have gotten lost somewhere in Arizona, lol! Until then, I've created one last spread in my CTMH binder and then we'll be getting ready to go on vacation. So I will have to wait to show you all the new goodies until when we get back mid-October! 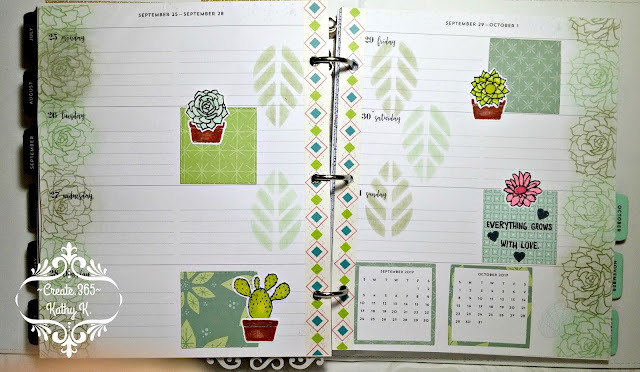 This spread turned out "ok", but I am not in love with it...I think I liked using the rectangle dies better than the squares proportionally for this horizontal layout scheme! 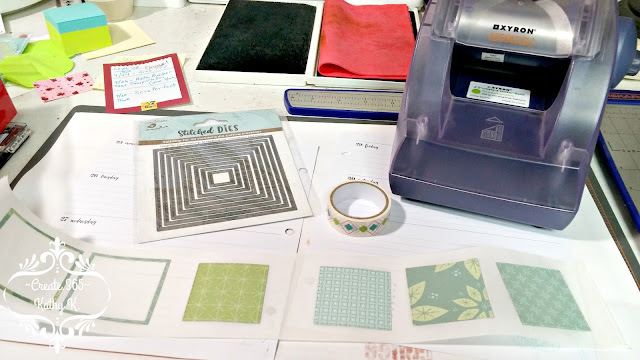 I used a stitched squares diecut set from Itsy Bitsy, washi tape (I think from ACMoore or Hobby Lobby -I honestly can't remember anymore), old patterned paper from Stampin' Up and my sticker maker. 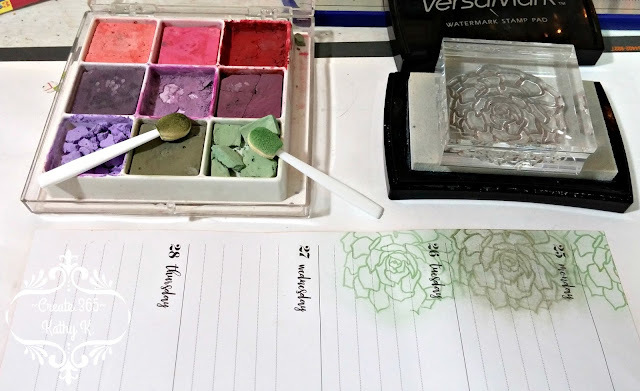 Instead of ink blending this time, I chose to go the route of using the Poppin' Pastels technique. This worked perfectly -except for my first attempt when I tried to use a metallic chalk and it failed miserably! So I had to try to erase it and start over...which didn't work out so well, so that is why there is a dark spot near the top of that left hand side page. 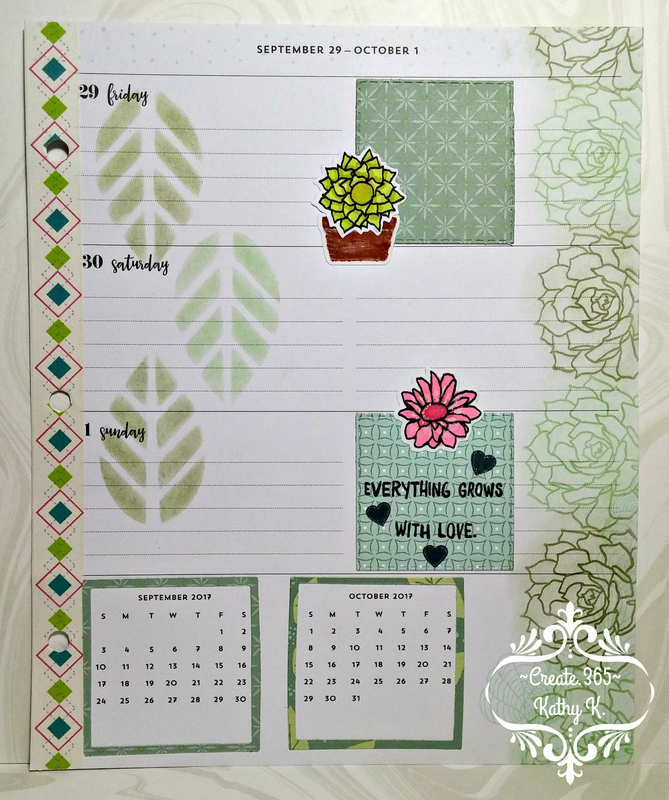 After I made the switch to regular chalks in 2 shades of green, it worked beautifully! 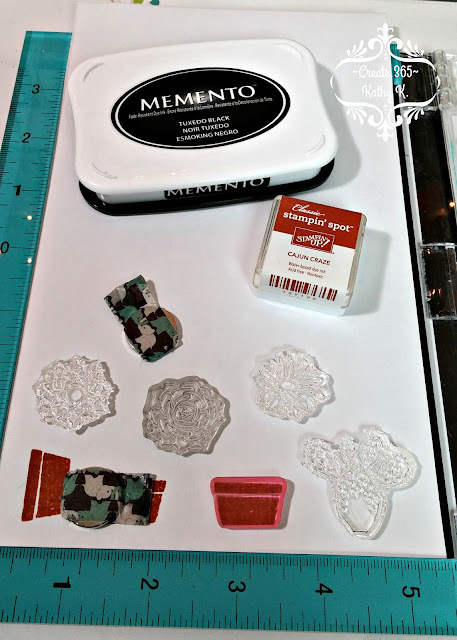 Next I did some stamping on sticker paper for my accent pieces using two stamp sets from CTMH. 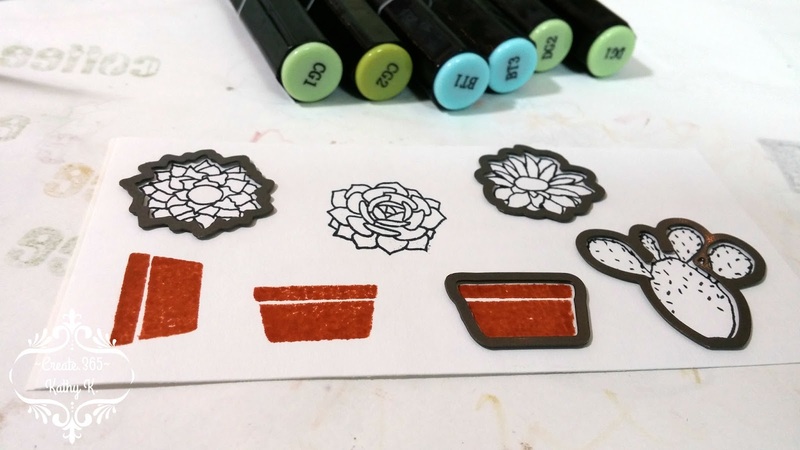 I discovered after the fact that I didn't care for the base pot being stamped in a solid colored ink and the plants to be line drawings that needed to be colored in. Maybe if I had stamped them in a lighter ink and done the no-line-coloring technique I would have been much happier with the results...I'll have to try that next time instead. At least by using my stamp positioning tool I was able to stamp many small images in one fell swoop! I did my coloring using Spectrum Noir pens and then die cut everything that had a matching die and fussy cut the rest. I used a standard office hole punch to punch the holes for the binder in the washi tape and adhered all my custom made stickers exactly where I wanted them. The leaf stencil is from STAMPlorations and I also used those same two green chalk colors to add the soft leaves across the pages so that it didn't look too bare.